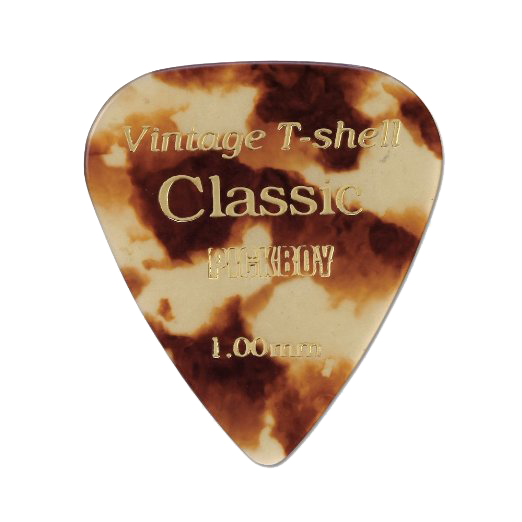 "I have been proudly using the Pickboy Vintage T Shell picks for the past 12 years. They are by far my favorite for playability, durability, and tone!" Eddie Heinzelman is an in-demand and well respected session musician/sideman who currently plays guitar, mandolin, and sings background vocals with hit songwriter and Country artist, Radney Foster, along with some of the biggest names in Country and Americana music. Eddie's second solo album, "Wherever You Go" drops in November 2018 and offers up an infectious mix of Americana, country, roots rock, and classic jams. Says Eddie, "this album has more of my own style and direction," adding that he hadn't been previously operating under complete creative freedom. "I was doing what everyone told me I was supposed to do in order to get a publishing deal in Nashville, but I had set aside making the music I wanted to make. This is me writing and performing—focused on being honest and true to the art and the craft of songwriting, improvisation, and the music, and most importantly, to myself." A native of Brookville, IN, Eddie began performing professionally at the age of 13, quickly establishing a reputation as a premier and versatile guitarist around the Cincinnati, OH area, working with regional and national acts in various genres from country to rock to jazz and classical music. After graduating from the University of Cincinnati College Conservatory of Music's Jazz and Studio Music program, Eddie formed the country band, Durango, with his brother and released an EP, 'Closer To Home' that was featured in the CMT Dance Link video series. Soon thereafter, he moved to Nashville, TN to focus on writing songs and began playing guitar live and on sessions for other singers and songwriters. His extensive resume includes performing with a variety of artists, including jazz legends, Joe Henderson and Norris Turney, opera star Barbara Daniels, pop star Tiffany, Broadway star Michelle Pawk, and Contemporary Christian artist, Jason Crabb, as well as a literal "Who's Who" of Country, Bluegrass, and Americana artists: Radney Foster, Darius Rucker, Kelly Willis, Ricky Skaggs, Jack Ingram, Chase Bryant, Larry Gatlin, Billy Yates, Mary Gauthier, Darden Smith, Bill Lloyd, Julie Roberts, Vince Gill, Deana Carter, Darryl Worley, Gene Watson, Jeannie Seely, Collin Raye, T. Graham Brown, Jimmy Fortune, Moe Pitney, John Berry, Ty Herndon, Bill Anderson, Jim Ed Brown, Buddy Jewell, Marty Raybon, Mandy Barnett, Rhonda Vincent, Dailey & Vincent, George Ducas, Danielle Peck, Sunny Sweeney, Trent Tomlinson, Teea Goans, Adam Gregory, Leona Williams, Jimmy Payne, LuLu Roman, Andy Griggs, Due West, Trailer Choir, Tammy Cochran, George Hamilton IV, Jeff Bates, Sherrie Austin, Ray Scott, Brice Long, Lance Miller, John Rich, Jeffrey Steele, Kevin Denney, Amber Hayes, Noel Haggard, and many more! A dynamic and charismatic performer whose versatility and experience as a musician enhance his songwriting talent. His debut album, "Hey, Songwriter" was released in February 2017. I’ve just released a new album on Nov 9 called “Wherever You Go”, my single “Dandelion” is currently at Americana radio. I have two signature guitar pedals with Keeley Electronics called the Verb O Trem and Verb O Trem Workstation that recently released on Nov 15, I’m going to be on the Grand Ol’ Opry on Dec 15 and on tour with Radney Foster again next year, I’m writing a book, and currently booking 2019 tour dates. I started playing at age 8, studying Classical and then Jazz guitar, and began performing professionally at age 13. I graduated from the University of Cincinnati College Conservatory of Music with a degree in Jazz and Studio Music and moved to Nashville, TN to pursue songwriting, session work, and began touring as a sideman for other artists. I have so many influences but some of my biggest guitar influences are Jimmy Page, Robin Trower, Stevie Ray Vaughan, Dickey Betts, Clarence White, Albert Lee, George Benson, and Jim Hall. I have studied music nearly all my life, taking lessons since I was 8 years old all the way through college and beyond. I am an advocate for education in music and believe it has an extremely important role and can certainly lead players to a level of understanding, self discovery, and expansion of their own creativity. In many ways, the change in format (streaming vs cd sales) has very much impacted the ability for musicians and songwriters to make a living. You used to be able to get a song on an album and make some money. That has diminished significantly. On the other hand, there seems to be more opportunity to perform and technology has certainly made it easier to record and distribute original music now. For example, I collaborate and record tracks in my home studio for people now. I see all aspects of the industry as a sideman for other artists and especially as an artist with my own projects. However, to me, music is still and will always be about communicating with an audience and touching people emotionally through song. I went on an extensive pick search about 15 years ago. At the time, I was using different pick brands and gauges depending on the genre of music or instrument I was playing. Then I discovered Pickboy at a music store I taught at. What I found in Pickboy is the perfect combination in one pick that I have used ever since: durability, shape, and most importantly, feel and tone. I have used the Vintage T Shell Classic 1.00 mm for over 15 years now, and I absolutely love it! I’m very proud to be part of the Pickboy family!